While one might expect that a company such as General Motors would be focusing on ensuring the success of short-term endeavors, the Detroit-based company decided to show its long-term plans by introducing us to the EN-V, a prototype vehicle built for use in urban settings. Though it lacks coveted cabin space, it certainly makes up for it with functionality that we have never seen in modern transportation. 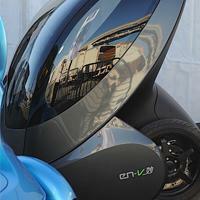 The EN-V stands for Electronic Networking Vehicle. How does this mini-car network? 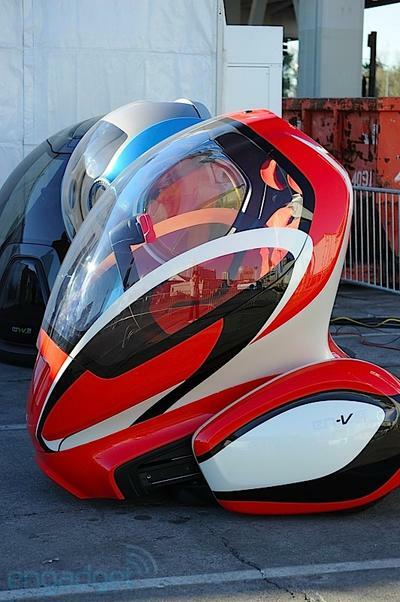 It has a futuristic function that it can “speak” to other vehicles. This is useful in a situation where the car in front of you makes a sudden stop, as the EN-V can detect the obstacle and begin to automatically slow-down for you. GM’s prototype contains sensors on the front of the car that can sense looming danger, even stopping the EN-V when pedestrians are in front of it. Another neat feature that will be implemented in the future vehicle is automatic parking. By accessing an app on your mobile phone, you can tell your car to find a parking spot while you go about errands. When you are done, you can tell it to come and pick you up. The shape of the vehicle allows them to collapse onto one another, allowing more EN-Vs to fit in parking lanes. The short-range vehicle already has some enviable (Do you see what I did there? The name of the car is the EN-V) technical specifications. The car can travel about 30 miles on one charge, carrying two passengers, meaning that one could certainly go a day without recharging in an urban setting. However, it can only go about 30 MPH at this point in time, though they are expected to improve the prototype in the future. The futuristic transportation is a descendant of the Segway, having no suspension and the body moves separately from the base to maintain balance. It is a skateboard of sorts, as the top portion sits on atop of a flat base, and the top can move independently. I drive 11 miles to attend school everyday, ending up in downtown Chicago. This would be an interesting solution to many problems that I have seen when driving in the city, the most prevalent being parking. Plus, there is no argument against using an electric vehicle, which is helpful to the environment and your wallet. What do you think of this neat little form of transportation? Will it be functionally useful in future urban settings or will it just be ridiculous? Would you give up the space that a full-size car gives you for this? Does this even be defined as a car? Let us know in the comments below.